It’s time for “First Line Friday” again! I love the name Walter Berglund. Not sure why. It’s cumbersome, to be sure, but it sticks. Walter Berglund. Sounds American. Sounds like a protagonist. I love how much this sentence says: There is a guy named Walter, he had a wife named Patty, they had lived in St. Paul, then moved to DC, and there is some unforeseen “news” that we’ll learn about later in the novel. It’s actually quite a lot of information for one line, but it’s smooth and eloquent. Not unruly or overly burdensome. I love the phrase “the urban gentry of Ramsey Hill.” The phrase so accurately depicts white people coasting through St. Paul in an Audi on their way to Starbucks prior to attending their daughter’s lacrosse game. It says all of that in 6 words: The Urban Gentry of Ramsey Hill. Love it. As for the rest of the novel, I am still torn almost a year after reading it. It has glimpses of greatness, but also has lulls of meaningless. But that’s a topic for another post. Just enjoy the first line today. "...white people coasting through St. Paul in an Audi on their way to Starbucks prior to attending their daughter’s lacrosse game. It says all of that in 6 words." I also think it's interesting that he shied away from the split infinitive at the end there ("as not to read" instead of "as to not read", which I think packs more punch.) 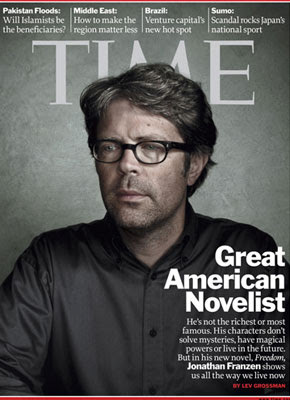 I wonder if it was Franzen's call or the editor's. Query: Did you like this line when you began reading, or is it only in hindsight that it nicely encapsulates the book? I tend to think the latter, but would be interested to know if you feel otherwise. Not sure, Orlando. When I read, I definitely savor the first line more than other lines. Again, not sure why. It's initial flavor of the novel, so I am really slow with it. So, to answer your question, it's probably a mixture of both. However, all of the lines I am highlighting in these posts are first lines that I actually remember, which indicates that they stuck out to me when I first read them.